A fire is not something we generally want to hear about. It’s often associated with disaster, death and destruction. But fire also gives warmth and light; we need both in abundance. 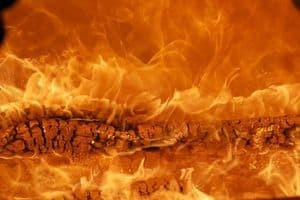 The fire that Jesus was referring to, was his Gospel, his Good News. Listening to His teachings, brings meaning and purpose to our lives, in times of troubles and happiness. Google Maps can’t give travel directions from our present point in life to God. Each of us must follow our own uniquely different path and each person must do their own searching. Lord Jesus, I pray that, with your help, I will travel the direct path to your rewards in heaven. I smile, and the world smiles with me. I laugh, and the world laughs too. I praise you, dear God, and the world breaks out in song. the key to my compassion. so that I may bring your joy to all I meet. Our History: On this day in 1483, 12-year-old Edward V succeeded his father as King of England but was never crowned. He disappeared, presumed murdered!